top quality canine companions, competitiors, assistance, and therapy dogs since 1999. Personal delivery available directly by breeder! There are many spellings of the breed name for this adorable little dog which include: Maltepoo, Maltipoo, Maltapoo, Moodles, Malt-oodles, etc. The deliberate crossbreeding of the Maltese and Miniature Poodle creates a wonderful new crossbreed known as the Maltepoo. This crossing produces puppies that naturally exhibit behavioral characteristics similar to the parent breeds. This generally results in a dog that is playful and energetic yet are gentle, extremely intelligent, eager to please, easily trainable, and very loyal to their human families. The Maltepoo is a natural family dog and tend to love everyone they meet. They are also great with kids yet are an excellent choice for a retired person that wishes to have a soft and cuddly lap dog. The Maltepoo coat is soft and fluffy with a slight wave to curl and can be found in a variety of colors. 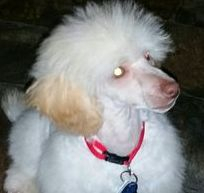 As with purebred poodles, color can change as the puppy matures (SEE BELOW). Maltepoos are considered completely non-shedding and tend to be a great choice for individuals with allergies. Maltepoos can be found weighing 5-15 lbs depending on the line. Our line produces puppies generally in the 8-12 lb range. Our puppies are true 1st generation Maltepoos bred from purebred, genetically sound, healthy Miniature Poodles and Maltese. Our Miniature Poodles and Maltese are all excellent examples of their particular breed and are fully genetically screened therefore our quality and consistency shows. We will be transitioning in 2019 to a fully genetic screened and DNA verified F1b line to increase the colors produced and add additional curl to the coat type. Due to poor breeding management and lack of knowledge by breeders over years, most breeds have a very high incidence of genetic health issues that are inherent to their particular breed. 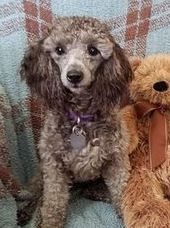 The poodle breed being one of those, it is crucial to screen any animals being used for breeding to be certain that those genetic faults aren't in our bloodlines. Unfortunately many uneducated and irresponsible breeders are out there and producing puppies that grow up to have a multitude of expensive veterinary problems that impact the puppy's quality of life as it becomes an adult. I encourage you to take the time to look over our page on "choosing a breeder" before you continue your search for a puppy of ANY breed. 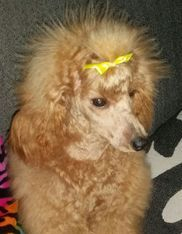 VERIFIABLE genetic testing should be completed on any poodle that is used in a responsible and ethical breeding program to eliminate many of the diseases inherent to the breed. Genetic testing is the only testing available that cannot be manipulated and is not based upon individual interpretation. Please check out the links below on choosing a breeder, our waiting list policies, photos and testimonials, and finally our puppies available! The color change process - "Scoop" - all photos are of the same puppy! This slideshow illustrates the most extreme color change possible - from black to silver! All photos are the same puppy. Silvers are always born black then clear to silver as they mature. With purebred poodles, an experienced breeder can usually pick out a silver puppy at birth and can confirm definitively at just a few weeks old. This is not always the case with Maltepoos as some do not begin the change until weeks after leaving the breeder. Photos courtesy of Steve & Lauren Bloom, owners of this Kack's Poo, "Scoop". We use the laboratories of Paw Print Genetics to complete full panel genetic testing on all of our breeding dogs. By completing full panel testing, we are electing to have our dogs screened for every test that has been developed for the breed by our lab of choice. Click on the Paw Print Pedigrees logo below to view the genetic testing results on our bloodlines. We also have every single one of our parent dogs microchipped for permanent identification as an additional means of verification. This means that we are able to scan the microchip of each of our dogs right in front of our puppy families so they know the results shown do in fact belong to that dog and aren't being used fraudulently on another dog. Please note that you may have to disable your pop-up blocker to allow the link to open in a new browser window. Meet the parents of our Maltepoo puppies! Weighing in at 6.5 lbs and son of our beloved retired foundation stud Kack's Magick Dragon Zach, this gorgeous boy has taken over as the sire to all Maltepoo litters born here at Kack's Saints since 2013. He has produced several litters of outstanding Maltepoos of even greater quality than his sire. He has an extremely loving personality and that shines through not only with people but with "his girls" as well. We like to say that he is "romantic" :) He likes to be held with his head snuggled up into your neck or hanging over your shoulder like he is giving you a hug. *All of our Miniature Poodle moms were sired by our very own gorgeous Kack's Furby Getting Fresh - View his OFA report by clicking HERE! Weighing 10 lbs, she will be continuing our brown and apricot bloodline out of Kack's Magick Sophia Loren sired by Kack's Furby Getting Fresh. Our phenomenal red girl out of Idaho Jewels Poodles in Rigby, Idaho... She is from our other line and is being bred to Wizard in 2019 before having a purebred litter for us in 2020. Our smallest girl, weighing in at 7 lbs, Medusa is sister to Pandora above. Both girls were from one of our 2015 purebred litters out of Kack's Satin and Lace Tease sired by Kack's Furby Getting Fresh. Do these dogs come with papers? 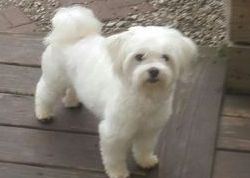 A hybrid dog such as a Maltepoo cannot be registered with the AKC, UKC, CKC, or other popular registries. There are "designer" or "hybrid" registries for crossbreed puppies. However, it is important to note that just because a puppy comes with "papers", it does not in any way verify the quality of the puppy and many times does not verify the parents are even purebreds. The paperwork required to register a dog with these crossbreed registries is very minimal to even non-existent! We provide a registration application with each of our puppies to the AMERICAN CANINE HYBRID CLUB as we understand our puppy families enjoy having that registration whether it be for their records or for novelty. We also send an ACHC certificate of pedigree home with each of our puppies. Our Maltepoos have registered purebred parents of their breed. We welcome our puppy families to meet both parents and examine any and all paperwork available in person at any time! We also provide links on our website to verify genetic testing results of our parent dogs with the laboratory directly. The mixes from purebred parents of different breeds has become very popular due to the outstanding health of the puppies if they are bred from healthy lines in the first place. Hybrid Vigor is a term that is used when you breed two purebreds of different breeds, the offspring are exceptionally healthy and first generation offspring from two purebred parents of different breeds don't carry the genetic problems common to that particular breed. Any genetic problems would start showing up in 2nd generation and beyond if one or both of the original parents are mixes themselves. It is for this reason that all hybrid puppies should be spayed or neutered to prevent any future offspring whether intentional or accidental. Multigeneration crossbreeding should ONLY be attempted by the most experienced and educated breeders that are willing and able to keep the strictest of records and possess the moral integrity to undertake such breedings (as noted below). generation to prove integrity of the bloodline. We also like to see breeders that permanently identify their breeding dogs by microchip prior to that testing so that the permanent identification is listed on all results. By breeding multi-generation, the breeder is attempting to create a new breed which produces consistent results and breeds true. Strict records must be kept for such an undertaking, otherwise they are breeding for profit only with no regard to breed integrity. Also, to take on something like that takes a LIFETIME as each generation must be raised far enough into maturity to evaluate the line. It takes at least 20 years to get 4 generations in if you are doing it responsibly! The most important thing that can be done by any person choosing a breeder for their new puppy is to ask to see verification. A good breeder will appreciate your commitment to ensure you are not supporting a backyard breeder or puppymill and will be happy to provide verification to you. We recognize the unfortunate amount of fraud amongst breeders and even many shelter and rescue organizations and the lengths that these profit seekers will go to in an effort to deceive unsuspecting buyers. Visit our "Choosing a Breeder" page to learn more. *Providing a high quality and healthy life-long canine companion is our top priority. Our puppies are all up-to-date on their vaccinations, worming, and other health checks before you come to pick them up. We will not release an unhealthy or sick puppy. We offer a FULL 2-YEAR GUARANTEE* against any life threatening congenital defects. In the event that your puppy from Kack's Poos is diagnosed with a congenital defect, we require you to contact us IMMEDIATELY so that we can have the littermates screened and that breeding line evaluated to ensure that we are producing the healthiest puppies. We have never had this happen, but this is our policy in the event it ever does. While you are able to keep the current puppy, as we understand an emotional bond will already be in place, we will still provide you a replacement puppy from another litter at no charge. In the event of the death of the puppy, we require that we receive the necropsy report from a licensed veterinarian within 3 days of death which states that the death was directly due to a congenital defect. We offer a Limited LIFETIME GUARANTEE* on all of our puppies against any congenital defects that become evident after 2 years, under which we will supply you with a replacement puppy at half price for any life threatening issues covered under our guarantee. *Due to the varying kinds of food and different environmental conditions the puppies come in contact with, we will not guarantee their health unless they are given NuVet Plus® using NuVet Labs’ recommended dosage, fed Life's Abundance Diet, and have received routine veterinary medical care by a veterinarian in the state in which the puppy resides; including their puppy series vaccinations, tri-annual boosters, heartworm prevention, and flea prevention. Tri-annual blood titers showing an adequate level of protection is acceptible in lue of vaccinations for those that choose not to vaccinate as we realize the need for allowing personal preference in this area. Also for those wanting to raise their puppy in a completely holistic way, we do allow the use of herbal heartworm preventative and flea preventative if under the advisement of a licensed veterinarian. Failure to do so makes the guarantee null and void. Links are always provided on our website to the required products. A print copy of the above guarantees are included in your puppy kit when you pick up your puppy. If at any time during the life of any puppy from Kack's Poos is unable to stay in the placement home, we will accept the puppy/dog back here with no questions asked! In the event of rehoming for any reason, the new owner's contact information must be provided to Kack's Poos in written or email form including name, address, telephone number, and email address (if available) PRIOR to the placement. We do not ever want one of our fur-babies to end up in a shelter or rescue! Disclaimer: This information is not intended as a substitute for the reader's independent judgment and personal responsibility. The information on this site is designed for educational purposes only and provided by Renee M. Kachenmeister, a Registered Veterinary Technician, groomer, and experienced breeder. It is not intended to be a substitute for professional veterinary care. You should not use this information to diagnose or treat any health problems or illnesses without doing your own research and/or consulting your veterinarian. This site may redirect its visitors to external website links. Kack's Poos does not operate these websites and is in no way responsible for any damage these sites may cause, although we may receive an affiliate commission if/when you make a purchase at those said websites. A portion of which goes to help keep this site maintained. However, this is only done when our independent research has shown these products to be superior in maintaining the health and well-being of our pets.